There has been much attention in the media recently about Michael Schumacher's condition following a skiing accident in the French Alps on 29th December 2013. It is reported that Schumacher was wearing a helmet when he fell and hit his head on a rock. Although he was conscious at the time, his condition deteriorated and he remained in a coma over two months later. 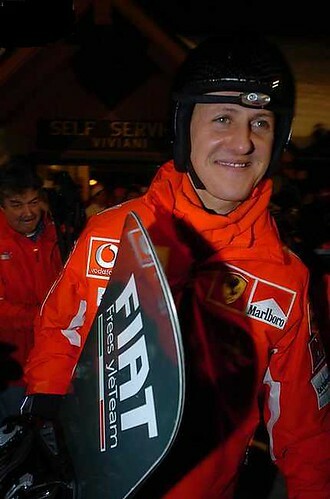 Although wearing a helmet didn't prevent Schumacher suffering a serious head injury, doctors have said that he would not have survived the fall had he not been wearing one. A few years ago you may have been in the minority wearing a helmet on the ski slopes, but more recently they have become more popular and it is estimated that around 70% of skiers and snowboarders now wear helmets, compared to just 25% in 2002/3. Many are still campaigning for helmets to be compulsory on the slopes, and it is clear that helmets do reduce the incidence of minor and moderate head injuries and lacerations. There have been varying studies on this issue which suggest that wearing a helmet reduces the risk of head injury by anywhere between around 43% and 60%. However, the wearing of a helmet should not be viewed as complete protection and should not give the wearer a false sense of security. Studies have suggested that in order to protect the head from a direct impact at 30mph, a helmet would need to be at least 18cm thick, 50cm wide and weigh in excess of 5kg! It is reported that head injuries account for at most 10-20% of all snow sport injuries. To put this in perspective the average risk is said to be about 0.5 per 1000 skier days - which is really very low and of course most of these are minor injuries. It is however important to realise the dangers of these sports, and to protect yourself as far as possible. Unfortunately for Schumacher he was among the unlucky ones. Doctors have not given any definite prognosis for Schumacher’s likely recovery, but are now saying that a full recovery is unlikely. It is reported that last month Doctors began the process of withdrawing sedatives to try to wake him up, but the fact that he hasn't yet woken suggests the injury has been very severe. Recovery from a coma is a gradual process, normally starting with the person’s eyes opening, responding to pain and then speech. Unlike in the movies people do not just wake up one day and return to their pre-injury life. The length of coma is one of the most accurate predictors of the severity of long term symptoms. Generally it is thought that the longer the coma, the greater the likelihood of residual symptoms. However this is only a guide and there are always exceptions with some people making a good recovery after an extended period in a coma. There are many possible outcomes after a coma. A small number of people sustain injury so severe that although they emerge from coma, they have no conscious awareness of themselves or their surroundings. Some people show distinct but limited signs of awareness; they may be able follow simple commands and communicate using simple words or gestures. Others may have a period of post traumatic amnesia after a coma. Their behaviour may be restless, uninhibited and agitated and uncharacteristic behaviour such as swearing or shouting is not unusual. Headway, the brain injury association of which my firm is a member, have a comprehensive Coma and reduced awareness factsheet which I'd encourage you to read for further information. Following a traumatic brain injury, recovery is a very long and slow road. The effects of such a serious injury can be wide ranging and depend on a number of factors including the type, location and severity of the brain damage. Different mental abilities are located in different parts of the brain, so a brain injury can damage some, but not necessarily all, skills such as memory, understanding, concentration and speech. Often a person must re-learn physical skills and the gradual return of these skills continues for years following the injury. No two brain injuries are alike and the course of rehabilitation is different for each person. For some people rehabilitation is a lifelong process, but many individuals are able to return to the majority of their pre-injury roles at home and at work. One of the most disconcerting effects of a brain injury can be personality change. For some, a brain injury might leave a person vulnerable to agitation, volatile emotions, physical aggression and impaired impulse control. These problems may occur only occasionally, or be a repeated challenge on a daily basis. Behavioural changes can be stressful for families and caregivers who must learn to adapt their communication techniques, establish relationships and expectations of what the person can or cannot do. Even a person who makes a good recovery may go through some personality changes, and caregivers must be careful to avoid comparing the person to the way he or she 'used to be'. If you have seen the film 'The Crash Reel' you will know the similar story of Kevin Pearce, a snowboarder training to compete in the 2010 Winter Olympics. He suffered a traumatic brain injury after a fall during training and the film shows the intensive and long process of rehabilitation. Despite his determination to return to the sport at a competitive level, as a result of his brain injury his skills were impaired and even a small blow to the head could be fatal for him. Many people are fortunate enough to not have come across or had to deal with the trials of sustaining a head injury, but for many people this is a daily struggle. It is estimated that at least 1 million people are living with long term effects of brain injury in the UK today, and that every 90 seconds someone is admitted to hospital with an acquired brain injury. Many occurrences of traumatic brain injury happen through freak accident, and for those victims we must focus on recovery, care and support. But whenever we have a chance to reduce the possibility of a brain injury, as in the case of compulsory helmets on ski slopes, we must strive to make sure this happens. Skiing with a helmet saved Michael Schumacher's life, and wearing one shouldn't be optional.